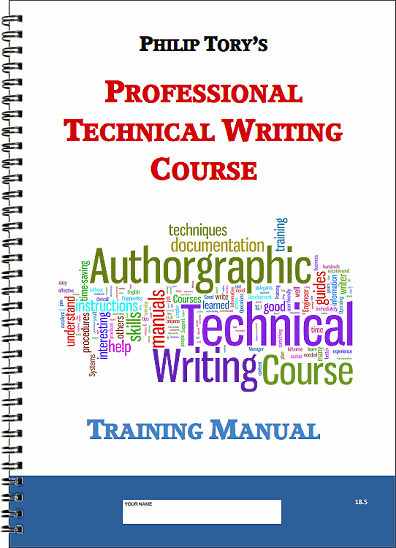 Learn how to write professional Instruction Manuals, Operating Procedures, User Guides etc. Read about it below . . . The download link is further down the page. Fact 1 – Save Time: Invest time in working through this self-learning manual, and then save time whenever you have to plan and write technical documentation. Fact 2 – Save Money: Better Technical Manuals mean fewer Support Calls. Fact 3 – Increase Sales: Good Manuals are a valuable Sales Aid. I was in Technical Sales and Marketing for 20+ years, and I know for a fact that good Product/Service Documentation helps to Win Orders. No Charge! – this is now for FREE! When I ran this one-to-one course for individuals, the price was £395; for training groups on site, over £2,000. Me: Since 2004, I have trained several hundred people across 11 countries. In my work as a Technical Author, I continually researched the subject carefully across English-speaking countries, and updated the course as needed. See more about Philip Tory. Now that I have retired, I still want to pass on the best of my skills. So I'm offering you the full course as a self-study, Technical Writing Course Workbook as a PDF for FREE. Important: If you want the best out of this course, I recommend that you print the whole manual, double-sided, and get it spiral-bound. Then you can read through it page by page, highlight the important bits, jot notes in the margin, and work through the exercises properly, two pages to view. This will help you, trust me. Printed copy? If you want a printed copy, I have a few in stock, for £45 per copy, including UK postage. Please contact me for details. Excellence: It's 150 pages of A4, and condenses the best of over 20 years of professional writing and training experience. Improve your documentation at work, and change the way you write for the rest of your life. Help me, help others . . . If you can, please would you provide a link to this page from your web site or media pages? Let's spread the good news, and help lots more people to benefit. Thank you. This Technical Authoring Course is for ANYONE who writes Technical or Business Instructions of any kind … such as Engineers, Programmers, Trainers, IT Departments, Managers, Technical Authors, Business Analysts, Administrators, Safety Teams, Product Managers, Support Teams, Project Teams, etc. 1. Understanding: Your readers will understand your instructions more easily. 2. Learning curve: Speed up the user's "learning curve", so that they become productive more quickly. 3. Reduce your incoming Support Calls: Some companies have saved £ thousands a month by writing better manuals and procedures. 4. Learn from an experienced author. I have written manuals for some of the finest organisations in the world, and I want to teach you the best of my skills. I have condensed over 20 years of career experience and research into this one-day course. Now it's available to you in the form of a self-study, 150-page A4, Technical Writing Course Manual. 5. Plain English: This is a major feature of what you need to learn. You want your target users to read something once, understand it, and carry out the tasks without mistakes, accidents or support calls. And the Course Manual itself is, of course, written in Plain English. Writing techniques that help your readers to understand 'technical talk' quicker and more easily. Best practices for writing in clear, user-friendly English. How to target the reader/user groups; how to write at their level without being patronising. How to work faster for the same effort. How to create an "Index at the back", quickly and easily. And lots more. Action: Click here to see the Course Outline. Improve your Authoring Style for the Rest of your Life! "This course is really going to save me precious time. I would recommend it to anyone who has to write and maintain any type of document." – Kyla Young, Operations Manager, Dataflow Communications. "The course was useful and informative. Good pace and delivered at a level understandable to the delegates. The most interesting part was the Plain English module, because it's been a long time since I was at school and I had slipped into bad habits." – Glen Norman, PTW & Training Coordinator, LES Engineering, Humberside. “Very interesting. The content was excellent and meaningful to my job. I learnt a great deal – many things I didn’t know before. I would recommend this course to others.” – Mandy Raison, Learning & Development Manager, Airborne Systems, Bridgend. "The section on planning was the most interesting as this is something that is immediately relevant. Overall, a very good course. It presented a number of techniques that I can use immediately with no extra tools." – A. Hall, Head of Development Methods Group, Bank of England, London. “I did actually use the techniques soon after, to produce a report that led to a request for expenditure approaching 8 figures, which has been well received, so thank you.” – Richard Carver, Offshore Operations Engineer, Perenco, Norfolk. “I learned a good understanding of the role of a technical author, and what I need to plan and consider. The training day was well-presented and kept my interest throughout. Questions were well answered and discussed. The course manual provides good post-course resource. It will be a good point of reference when I require tips and advice. It was an excellent course.” – Brian Livingstone, BAE Instrument Landing Systems, Telford. “The course was well planned with effective communication and presentation. I learned how to minimise my writing style and offer more informative, easy to understand guides. Overall, a very good investment of my time.” – Graham Carter, Telecommunications Dept., University of Bedfordshire. “The training course was very interesting and showed me some basic errors that I currently do without thinking. I learned a lot of details about making documents simpler and more user-friendly. Excellent information.” – Andrew Thalayasignham, Production Engineer, Airborne Systems, Bridgend. “Very interesting and enjoyable training course. It made me think twice about how my writing comes over to others. I’m sure it will help me to get my message across in a simpler and clearer way in future. Definitely worthwhile.” – Alexander Findlow, Snr Telecoms Engineer, Perenco, Great Yarmouth, UK. 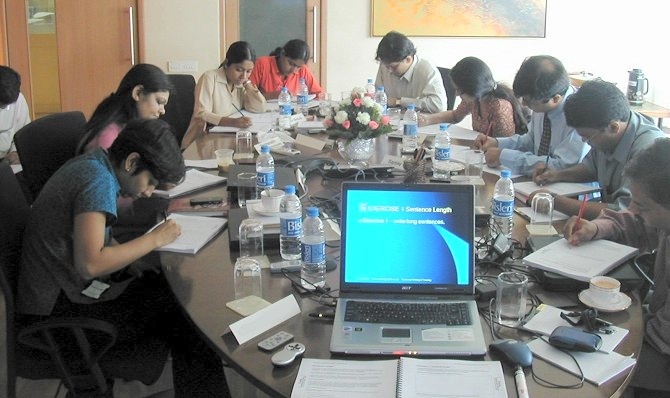 I ran this Technical Writing Course for a Pharmaceuticals company in Mumbai, India. Technical Writing Course for any Business or Industry. Learn from an expert and international trainer. Expert Technical Writer and International Trainer. A User Manual that I wrote for a high-efficiency, Industrial Burner Controller.